First of all, let me tell you that I am flattered that you are interested in purchasing one of my prints! As a Fine Art Landscape Photographer, it is incredibly rewarding and gratifying to know that someone else is so connected to my vision, that they want to have one of my photograph in their home! the first thing, of course, is to pick your favorite photograph, then you will choose the size (see below), lastly, you will need to decide whether you want just the print or a photo print mounted on aluminum backing. Color Photographs will be print on Fuji Crystal DP II, which is a high-quality paper that produces vibrant colors and great contrast. A UV-protective laminate will be added to your photo print, colors will not fade for at least 75 years. The photograph of your choice can be also printed and mounted on a 1/8" (3 mm) thick aluminum backing, which consists of a black polyethylene core sandwiched between 2 aluminum sheets coated platinum-white. It ensures stability while maintaining a low weight. A UV protective laminate will be applied to the photo print, to prevent fading. The laminate is very high-quality and long-lasting. The integrated wall-mounts on the back of the picture make it easy to hang it securely. So the photo will arrive at you, ready to be hung! Art-secure packaging is always customized to your individual piece. Large-format and panoramic works will be shipped in tailor-made wooden crates. 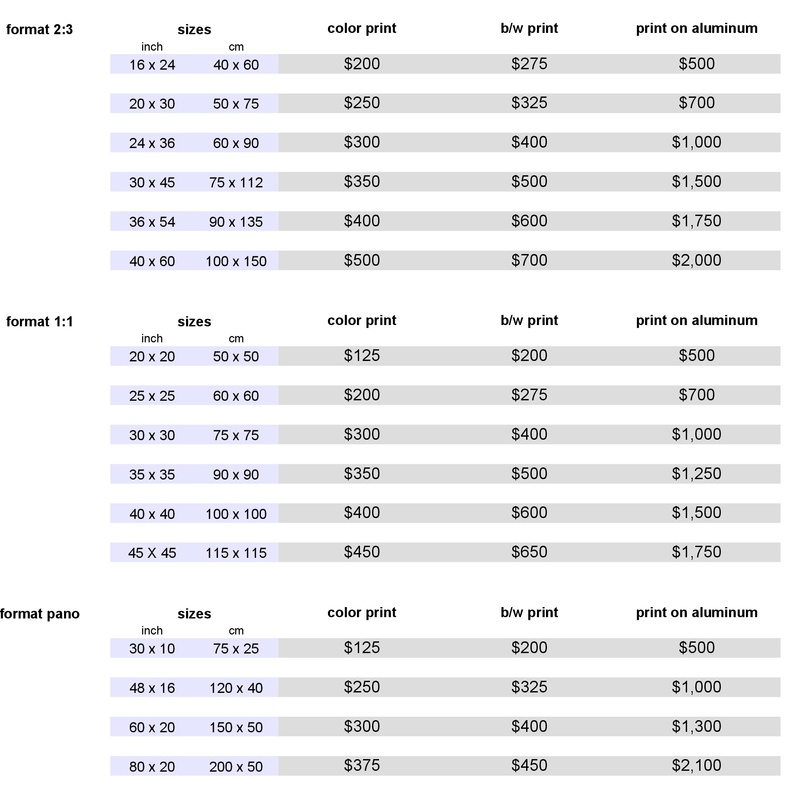 Here the most requested format and sizes, please inquire about different sizes. The Price includes the shipment cost worldwide.